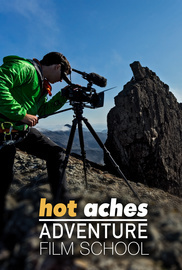 A series of free masterclasses on adventure filmmaking from Hot Aches Productions. A series of free masterclasses on adventure filmmaking from Hot Aches Productions. These include the '60 Minute Adventure Film School', 'A Crash Course in Adventure Sound' and 'How to shoot interviews'. We'll be adding to the collection so keep an eye out for more instalments.